Drying clothes outside the window or outside the house on a cloth line has been very common in India. Even till date most of the people use this method to dry their clothes post wash. But because of influence from the west and movement of NRIs back to India, sale of cloth dryers has been increasing in India. Cloths Dryer provides quick and easy solution to dry clothes post wash with lesser need for ironing. But all this convenience comes at a cost that is increase in electricity bills. And being a heating device, it adds a lot of units on electricity bills. It not only adds a lot of units on electricity bills but it also adds to a lot of load on the electricity grid as most dryers are rated at 2 kW+ of power. So how much electricity does a dryer consume? A lot depends on the load size and the amount of water or moisture on the cloths but typically they would consume 1.4 to 4 units (or kWH) per load. Cloths dryers that are very common in America use about 4 unit (or kWH) of their average household as per Lawrence Berkeley Lab (source1 and source2). We at Bijli Bachao tried to do an evaluation at a friend’s place and found that they had a washing machine that made sure that the clothes came out 90% dry and using a cloths dryer after that consumed 1.4 units of electricity for a single load. The machine size was optimum for a family of 4. Even the load size was optimum for family of 4. The high dryness quotient of the cloths that came out of the washing machine made sure that the electricity used in the dryer was less. The electricity consumed by the washer in spinning to make cloths 90% dry came out to be 0.38 units which is 50% higher than that of usual spinning. If a family washes cloths and uses dryer every day, the total units will come about 40-120 units a month! The cost of the same can be evaluated by finding the average unit cost of electricity using our calculator: Online Electricity Bill Calculator – For all states in India. While buying a cloth dryer try looking for an option that has moisture sensor. This will make sure that the dryer shuts off as soon as the clothes are dry. This will not just save electricity but will also make sure that the clothes are not damaged due to over drying. Use more of spin-drying on the washing machine than drying cloths in a dryer. Mechanical drying uses lesser electricity than thermal drying. A front load washing machine is more efficient than a top load washing machine in drying cloths. So prefer buying a front load machine. Clean the dryer filter after every load. It improves the efficiency of the dryer. These days the whole world is talking about going green. People are trying to identify what is necessity and what is luxury and trying to cut down on some luxuries to go green. Cutting down on use of cloth dryers and using cloth line is identified as one such way of going green. Even in America people have started considering cloth dryers more as luxury than a necessity (source). These days a lot of luxury complexes coming up in metros and big cities. In many of these complexes people are asked not to dry their cloths outside on a cloth line just because it impacts the look of the complex. But there are multiple ways in which one can use effective air-drying of cloths. These days drying racks of various shapes and size are available in the market that not only look good but also provide a great way or air-drying cloths. Cloth lines are available that hang up on the ceiling and virtually hide all the hanging cloths from the view. Builders have started providing dry areas in apartment complexes, which people can utilize to dry their cloths. 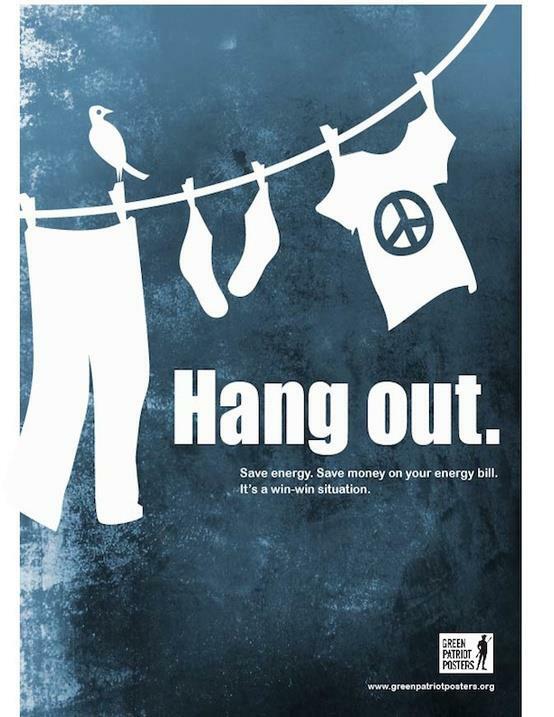 On the whole hanging the cloths out saves electricity as well as money and makes one go green.